The only thing scarier than those scary scary clown head trash cans at my littlest daughter’s birthday party5 is the prospect of saving enough money for her college tuition. For my eight year-old, I’ve got just 10 years to go before C-Day, so I thought I’d share my current ex-banker thoughts with others, in the hopes that we can experience this horrific fear together. Also, “saving for college” allows me to discuss my favorite topic (compound interest!) so that’s always a good enough reason by itself for a Bankers Anonymous post. I see three big questions about college savings, with the most interesting one being #2. Question #1: What college savings account or investment vehicle, if any, should I use? Question #3: What kind of investments do I need in my college savings account? Question #1: What savings account or investment vehicle, if any should I use? Open up a 529 College Savings account. But, why a 529? Also, which one? The first “why” is because you may get an income tax advantage when you make a 529 account contribution, depending on the state you live in. When I lived in New York and paid New York state income tax, I enjoyed an income tax break on my contributions. Now that I live in Texas, I get no state income tax advantage from 529 account contributions.6 So that may, or may not, apply to you. The second ‘why’ is that any capital gains or investment income – which might be triggered when I sold stocks or earned interest on my investments – remain protected from taxation in that year, assuming I do not make withdrawals from my 529 account. If I just held my college savings in a regular, taxable, brokerage account, I’d be required to pay taxes on capital gains or other income from my investments. The result of this 529 account tax protection is that I can grow my money much faster than in a regular, taxable, brokerage account. I opened a New York state account for my oldest daughter because we lived there, then. My youngest was born in Texas, but I opened a New York state account for her as well, purely for convenience sake. I prefer tracking both girls’ college savings information on a single website. Question #2 – How much do I need to save, monthly, to have everything covered? The College Board (The fun group that brought you the SAT, the PSAT the AP tests, and more!) has a couple of incredibly useful online calculators. First, they can help you figure out how much of college’s cost you, as a parent, will likely have pay. To try the calculator, go here. This calculator asks some specific questions about your family situation, plus your income and savings, and then tells you how much the financial aid department of a college will likely expect you to contribute for your child’s annual college expense. This number will be much higher than you want it to be. I don’t think of myself as wealthy, and generally we don’t have much left over at the end of the month. Which is why the expected contribution number from a typical financial aid department left my face feeling a bit tingly. Next, the College Board has a great college savings calculator to tell you how far your current plan will go toward paying for college. Before you go there, I’d like to warn you – the result is scarier than scary, scary, clowns. First, you input the current cost of college, an assumed rate of tuition inflation, how many years your child will attend, and how much you will likely have to pay, which you may have some idea about based on the first online College Board calculator above. Next, you input how much you’ve already saved, what you expect your annual investment returns will be, how many more years you have before your child goes to college, and how much you plan to contribute monthly, between now and then. You input all of that, and then you have a heart attack immediately and die, because there’s Just. No. Way. I personally can’t feel the whole left side of my face right now. For example, let’s say I’ve managed to put aside $19,000 for my 4 year-old up until now. And let’s say I plan to invest $200 per month until she turns 18, and I can earn a 7% return on my investments, via my 529 account. Also, assume a private 4 year college costs $50,000 per year today, the college cost inflation rate is 5%, and I plan to pay 90% of that from savings. I have an estimated shortfall of $276,399. Randolph, this isn’t Monopoly money we’re playing with. Some of you clever readers may just be smirking because your little darling will likely either get a ton of scholarships or else attend a state college, no? Well, the bad reality is that state college isn’t that affordable these days either. The average 4-year in-state tuition cost, according to the College Board, will set you back $21,477 this year. If I have zero savings for my 4 year old, but I manage to invest $200 per month, starting now, and she attends an average cost in-state college, I’m still $107,582 short, 14 years from now. The answer to the question “how much should I be saving per month to be totally set for tuition” is provided by the College Board calculator, just under the shortfall number. I’m sorry about this, but as you know: Compound interest is powerful. After you recover from this shock, you’re ready to move on to question #3. Question #3 – How should you invest your child’s 529 Account? This one’s easy, and frequent Bankers Anonymous readers will not learn a single, damned, new thing from me here, because the answer is unchanged from previous, similar questions about how to invest for the long run. Hopefully you noticed, from playing around with the college board’s calculator, that you need a fairly high rate of return on your investments from now until college to even have a chance of closing the gap between your current savings and how much you’ll owe for your child’s college, every year, for four years. Now, since returns have to be high, you have precisely one choice for how to invest: 100% equities. Let me further clarify, in a way that will again make me sound like a broken record for careful readers: You need to invest your long-term savings for college in a highly diversified low-cost (probably indexed) mutual fund, invested in stocks only. Why not bonds or other safe investments? Two reasons. The first reason is low returns. For the vast majority of us, we can’t afford to invest in bonds over the medium to long run. An intermediate-term bond fund will return somewhere between 0.5% and 2.5% right now, and that’s just not going to cut it. The second reason is that – on a probability-adjusted basis – you will get more from investing in equities. If you have a 5-year investment horizon, you will be better off entirely in stocks, rather than bonds, 70% of the time. If you have a 10-year horizon – as I do – you will be better off entirely in stocks rather than bonds, 80% of the time. If you have a 15-year horizon – as I do with my youngest daughter – a 100% stocks portfolio9 outperforms a 100% bonds portfolio 90+% percent of the time. Look, I play poker with the neighborhood dads, so I know that low-probability bets sometimes work out. But I also know it’s kind of stupid to make low-probability bets. Trust me, because I’ve been losing $20 a week on a regular basis to these guys, testing this hypothesis, since I’m not a strong poker player. You can decide to weigh down your kid’s college savings account with bonds, and you may be under the illusion that this is ‘prudent’ because they’re bonds and “bonds = safe.” But it’s not prudent, any more than it’s prudent to bet with jack seven off-suit. Would I advocate investing in 100% equities if my kid is going to college next year? Well, this gets trickier. 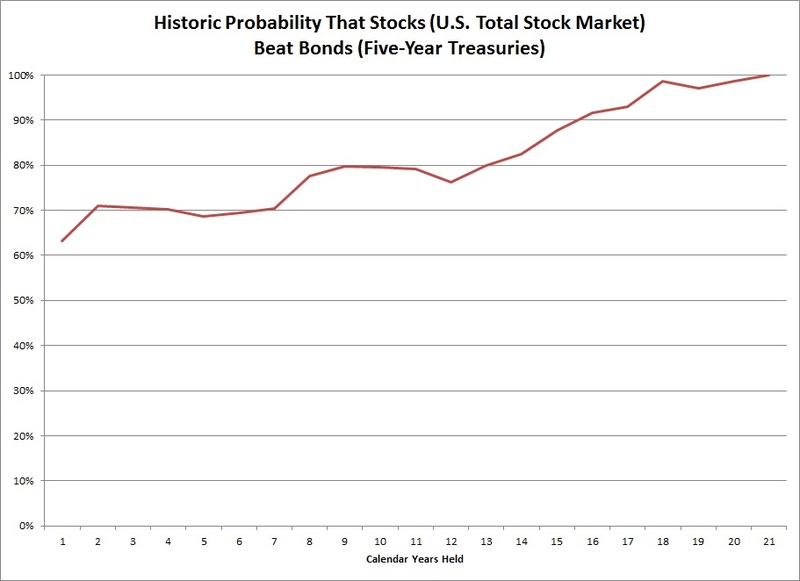 Stocks still beat bonds in most years, so if you want to play the odds – and if you have some kind of cushion – you could reasonably keep the account in stocks. Most of the time – on a probabilistic basis – this would be a winning choice. For my wife and me, that loud ticking we hear is not the biological clock anymore, but rather the college financial clock. For anyone in our demographic14 who checked the College Board calculator,15 I’ll now sum up the only other good pieces of advice I can think of related to saving for college. Open up a 529 Account for each kid. Like, right now. Stop reading blogs and do this immediately. Really. Did you do it yet? How about now? Set up an automatic withdrawal from your bank account, so you don’t have to make a choice about contributing every month. Because if you have to make the choice every month, the money might not be there. Even $25 per month in automatic withdrawals is better than nothing. Increasing that $25 monthly contribution over time, once the account is open, will be much easier than you think. And related post: Ask an Ex-Banker: Should I open an IRA? As a parent to a couple of preschoolers I really want to knwo if I’m wrong about this because heretofore we had decided not to use the 529 plans: There is nearly always (even for middle to upper middle class families) a financial aid calculation that you didn’t discuss. The schools basically add anything in a 529 plan to the financial aid picture and if your expected family contribution is lower than the cost then anything in the 529 plan is used instead of aid in the form of loans or grants. If grants, then it really is lost money on a 1:1 basis. My wife in particular really suffered from this because her parents basically saved diligently for years in a college savings plan and all it did was lower the amount of aid she would have received (as I understand it). I think any assets in retirement or primary residence are excluded from these aid calculations, and so too are retirement assets of the student. I would really add a caveat, that if you expect to get aid from the school you would be better off maxing out your own retirement and paying down your mortgage BEFORE contributing a dime to a 529 plan. Given the simple choice of saving with or without a tax advantage, obviously you’d take the tax advantage, but I think the financial aid calculation might really matter. You’re right I don’t address that, in part because it adds a huge element of uncertainty – we can’t know how college financial aid departments will view our family’s ability to pay now or in the future. And I’ll acknowledge some logic to your view: Essentially, why should I put aside my own funds, when a college financial aid department will offer proportionately less to my child, if my family appears to have more, set aside in a 529 account for example? Also, you make good points about paying down home equity and retirement accounts, if that’s available to you, as a way of building wealth without penalty from the financial aid departments. BUT – Here’s the two reasons I disagree with your view, or at least why I’m going to do my best to build 529 accounts. 2. Most colleges, most of the time, rely heavily on student loan offers, rather than relying heavily on outright grants, when putting together financial packages to their applicants. Having more in a 529 account reduces the probability of having to take out extraordinarily large debts for a student attending anything but the wealthiest colleges. Those are my main reasons…but you make good points to consider and add nuance to my post. Thanks. As for the Forbes article you linked…I totally agree with that author’s main point: First max out your 401K plans entirely before funding any college savings account. This is why I LOVE THIS BLOG. I had no idea that my kids’ admissions might be subject to my financials. I assumed that, like in public schools, admissions were separate and need blind-maybe there is more to this wealth inequality thing than I thought. Thanks for the post. Thanks for your kind words. A few wealthy schools are need blind, and many more schools offer merit aid to entice high scorers into their programs…but for the majority of schools and the majority of kids, unfortunately, money talks. At least, to some extent. And, to a greater extent than many will openly admit. What happens if stocks take a dive the year before you have to start paying? Can you fund with student debt and wait for the inevitable (almost) recovery, then cash out to pay the loan? I would love to see a post on the impact on inequality that comes from admissions policies that take into account the wealth of applicants’ parents and wether or not they attended a school, with a comparisons to systems in other developed countries. In the UK a university would be absolutely exorciated for taking account of an applicant’s family wealth or whether their family has a history of attendance, and in my opinion this is a small but worthwhile blow against inequality. Is there also a bias in favour of kids who went to high schools that traditionally prep students for top colleges (regardless of grades)? I find your posts on inequality illuminating and although it’s only tangentially related to this article (which, as I say, i also enjoyed in and of itself) I would love to see more on this from you. Thanks for your comment. I want to do a post, or a series of posts, strictly on inequality itself and how we talk about it and how we understand it. Ideally this will involve others’ opinions who disagree somewhat with me. I’m working on that. As for college admissions policies in the US. All the evidence I’ve ever seen (friends in the biz, conversations with high school and college admissions professionals) point to the fact that college admissions departments absolutely see themselves as an important catalyst for fighting societal inequality. I think they employ both implicit and explicit biases in favor of public school kids over private school kids, as well as favoring children of parents who did not go to college, for example. They take into account, and favor, kids of less privilege for whom the university will open up great economic opportunities. All the admissions people I know take that role seriously, and probably for good reasons. The really want to fight inequality. At the same time, universities are under pressure to pay the bills, so they also seek out full-paying customers. They balance the need for full-pay students with an aspirational goal of offering generous help to families unable to pay. And for college admissions in the UK: UK Universities, including Scottish Universities as well as Irish Universities, actively market themselves and target US-based students. Why? Because many US families can often pay full tuition, and university tuition is somewhat cheaper than it is in the US, so US families get a relative bargain. A win-win all around, from the UK university’s standpoint. About your stock-dive scenario? That is a real risk. Odds are, you’ll be better off staying maximally exposed to stocks, but of course bad things can always happen at the wrong time. Probabilistic odds don’t guarantee any particular outcome. My advice is more relevant for people who a) Have some cushion and b) Have the ability to borrow if necessary. I think my advice is ‘correct’ in the abstract. On the other hand, nobody’s paying me, so I don’t lose customers when I turn out ‘wrong,’ in the brutal reality of a stock-dive. If I was being paid, and I had the possibility of losing an angry customer (and therefore my own revenue), perhaps I’d be less insistent on being ‘correct’ and more likely to take into account the psychology of my paying customer. I have also heard the bit about investing for retirement before investing in a child’s college education. I think it’s really up to each family/parent on which to do, but it is also true that there are other options for a child to pay for higher ed, even if those options do come with a lot of debt. Once a parent reaches retirement age, then there is no where to get more. Learn more about different investment ideas at http://www.mutualfundstore.com/investment-planning.